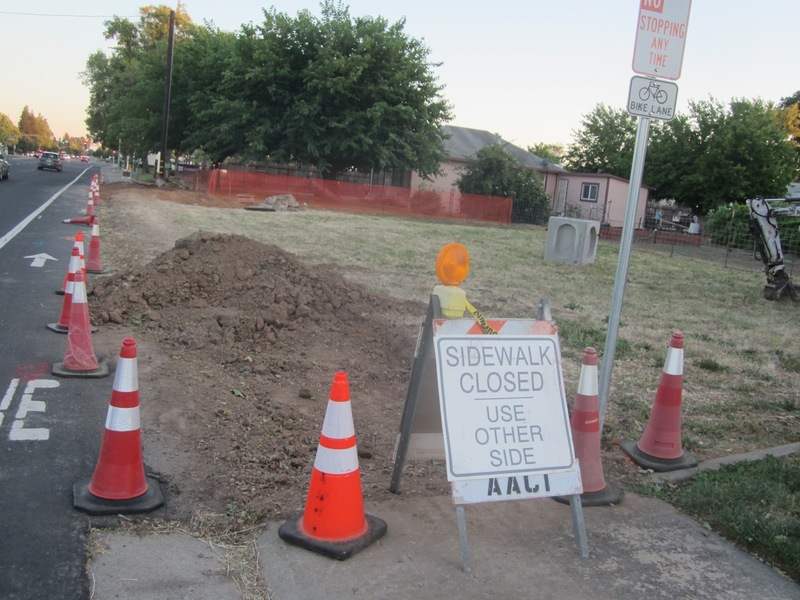 By any measure, a small capital improvement project that recently broke ground in Elk Grove is probably barely a blip on anyone's radar. When this project is finished, it will not attract any ribbon cutting ceremony or self-congratulatory proclamations by The Mayor or City Councilmen. However, it is representative of where we urge the City of Elk Grove to focus their efforts. The project we are speaking of is a new sidewalk being installed on the west side of Elk Grove-Florin Road between West Camden Drive and the Save Mart strip center on the corner of Bond Road. The sidewalk, which is about 100-feet, connects the sidewalk that was built as part of the Camden Passage neighborhood in the late 80's to the Save Mart strip center which opened in the mid-1990s. In other words, for about 20 years, 15 of which were under the jurisdiction of the City of Elk Grove, that short segment was one of many missing sidewalk links in Elk Grove. In fairness, through the years, the city has attempted to connect many of these missing sidewalk links, but there are dozens of other missing links. For residents of Elk Grove's Camden neighborhood who not only wanted the safety and aesthetics of having this segment linked, in a sense it marks a complete build-out of a neighborhood that started almost 30 years ago. For all the talk about soccer stadiums, expanding the number of rooftops and the city boundaries through the sphere of influence applications, private or otherwise, if our elected officials are being real when they talk about making strong neighborhoods, this is where they should focus their efforts. To their credit, there are significant projects like the rural area roundabouts and the trail extensions that are underway. We urge the city undertake more projects like this that will fill in missing sidewalk links, properly maintain our roads, build out our trail network in the city for those of us who live here already and bring better street lighting to our older neighborhoods. Until then any talk of more rooftops beyond the Southeast Policy Area is robbing Peter - Elk Grove residents - to pay Paul - home builders. As mayoral candidate and smart planning advocate Lynn Wheat said during her 2012 campaign, let's make Elk Grove better, not bigger. Definitely, let's do take care of what we already have before we take on any more pie-in-the-sky (even more obligations) projects! That is really good news. All those missing sidewalk links do affect people, even if drivers are oblivious to the lack of contiguous sidewalks. As a non-driver, that section has been impassable for me - not walking on Elk Grove-Florin Rd without the protection of being on a sidewalk!!! Lots more to do. Let's get to it, and also repair the DEPLORABLE sidewalks going throuh Elk Grove from the Library to Waterman. Some patchwork has helped, but really, it's a mess, particularly if one os older and doesn't seel all the cracks and obstacles which pop up along the way. Thank goodness, someone finally painted the dangerous protrusion in Old Elk Grove of one of the old buildings. I nealy tripped a few times. One would hope that the city council would "laser focus" on improving our neighborhoods and generally the things that make a city more livable, like having a network of sidewalk and trails. Even if the council members wanted to, which I don't think they do, they probably cannot. The way our finances are set up in this city, they are forced to get the new rooftops to pay for other things. The developers know this, so they throw the council members some table scraps in the form of campaign contributions, and they quickly fall in line and do their bidding with LAFCO to get more houses approved. Our city finances are similar to a Ponzi scheme - they need the money from the new Mello Roos fees coming from the new houses to pay for things that should have been taken care of on a pay-as-you-go basis. Actually, now that I think of it, they are more like tweakers looking for their next fix. EGN ~ Thank you for bringing up our disconnected trail network. The city has been making some progress on our off street trail system through various Capital Improvement Projects (CIP) as well as developer driven projects. Unfortunately the needs are many, money is tight, and progress is slow. I’ve been advocating connecting the Laguna Creek Trail’s existing segments on both side of Highway 99. I’ve often told the story of my wife as a child moving with her parents to the Camden Passage back in 1989. At that time there were plans to extend the trail west from the terminus in Camden. That was 27 years ago and the connection over/under Highway 99 and through the East Lawn property is still lacking. An entire generation has passed with little progress. What a travesty. Later this summer construction will begin on the Camden north and south spurs which will connect Camden Point and Bond Road to the trail at the west end of Camden Passage. These CIP projects will be a great addition to our trail network but residents will continue to look west with no connection across Highway 99 to Laguna. Hopefully it won’t take another 25+ years to complete.